When you open your mouth, it’s as if you’re peeking into a royal court because all you see are crowns. These are the parts of your teeth that are visible, rising above the gum line, but there are different circumstances that can leave them compromised. In these situations, you need a new dental crown in The Colony. Continue reading to learn how this restorative process works and ways to protect the new cap on your teeth. Why Would You Need a Crown Restoration? Your current cap is broken. The crown has suffered unusual wear, which has left you with an irregular bite. The cap has been compromised from severe tooth decay. You’ve had a root canal procedure done and need a new crown placed. If you have discoloration, a new cap on your tooth will offer an aesthetic improvement. One of the benefits of receiving a dental crown from Ridgepointe Dental is the quality of materials that will be used. Custom-crafted from porcelain, the new cap on your teeth will be durable and structurally sound, able to endure the rigors of chewing on different types of foods. Reduce the natural tooth material to make way for the new crown. Take a bite impression so that your new cap can be custom designed to fit properly. Send the information to a trusted lab so that your permanent crown can be fabricated. Once you get your dental crown, you want to protect it, so be sure to practice your regular oral hygiene habits, which should include brushing and flossing your teeth at least twice a day. Although the new cap will be resistant to decay, the tooth underneath and your gums are still very susceptible to bacteria. If they are infected, then your cap will be compromised because it won’t seat properly. But you can counter the harmful potential of these intruders by taking a proactive approach attacking bacteria before they can grow into serious problems. Another habit that you definitely want to maintain is visiting your dentist in The Colony at least twice a year for cleanings and checkups. At these appointments, he will clear away any bothersome plaque and tartar that have collected on your other teeth that could cause havoc. 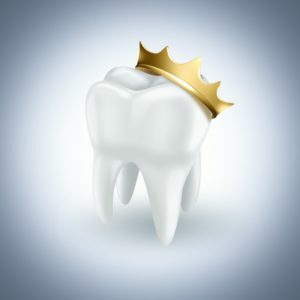 So if you’ve noticed that your current crown isn’t looking or feeling as royal as it should, then reach out to your local dentist for a dependable and aesthetically pleasing restoration today! Dr. Austin Amos earned his dental degree from the University of Texas School of Dentistry in Houston. Since then, he has remained on the cutting edge of technological advancements through continuing education classes and his affiliation with several professional organizations. Dr. Amos practices at Ridgepointe Dental and can be reached for more information through his website.